There are always numerous risks to watch for when it comes to our furry family members, and this time of year, pet owners are reminded to watch out for foxtails. These plants have a barbed seed head that can be extremely dangerous for animals and can work their way through a body causing extreme damage, and in some cases they can cause death if not treated quickly. If a dog or cat is exposed to these weeds, the barbed head is known to burrow into the body, and can move to other areas of their system, including major organs such as the brain, lungs and heart. Once burrowed, these seeds continue to move forward and due to the barb-like spines, cannot be removed easily. “Foxtails can be hard to find and do not show up on x-rays. They do not dissolve or absorb easily, which can lead to serious infections,” Katina Stewart of the Martensville Veterinary Hospital explained. 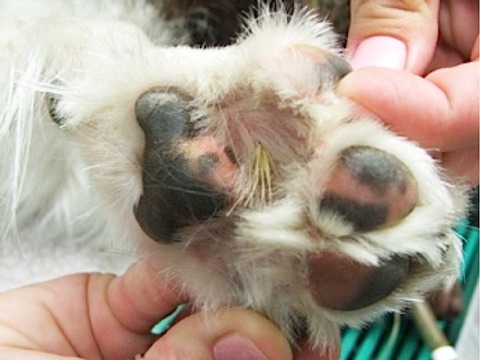 Foxtails can attach anywhere on the skin, and are often removed from around the ears and between the toes; however, they can be found in many other areas including, eyes, mouths, nose and others. Often, once a foxtail has embedded, pets will frequently lick and chew the area that is irritated. If in the ear, owners can watch for head shaking, scratching and crying and in some cases, a veterinary otoscope is required to look into the canal to see them and sedation may be needed to remove them. If a foxtail has found its way into a pet’s eye, you will likely see blinking, squinting, redness and/or tearing. “These signs in the eye are always considered a veterinary emergency, because there is risk of permanent blindness or the loss of the eye,” Stewart added. It is not uncommon for a pet to eat a foxtail; whether by accident, or on purpose, and often, once an animal has something that irritates their throat, they will begin to frantically eat grass or objects they would not normally eat. “This can make the problem worse, as more grass awns or more irritating material scratches or attaches to the already irritated mouth or throat,” said Stewart. Pets may also be hacking, coughing, sneezing or vomiting. There are times when an owner may see the awns of foxtail caught between the teeth, on the roof of the mouth, or near the tonsils. In most cases, the awns get caught in the tonsils, or the crypts that the tonsils sit in. “If this happens, sedation is required to see them and to remove them. If they are not removed, they can cause pain, abscess and migrate to deeper tissues that are harder and more dangerous to reach.” Once removed, Stewart noted that they recommend medication that will reduce pain and inflammation, as well as a diet of softer food with some gentle fibre added such as cooked oats, cooked pumpkin puree, or a specific formulated diet to help encourage the passage of any awns that are in the digestive tract. In some cases, other medications are required to protect the gut or to treat an infection. Incidences with pets and foxtails is not as uncommon as one might think, and according to Stewart, the probability of your pet or a pet you know will get them is high. This past July, Martensville Veterinary Hospital removed foxtails from around the tonsils of seven dogs, and some of those cases also had them removed from under the eyelids, their nostrils and ear canals. In 2017, a total of 13 pets required sedation and removal of foxtails with some requiring hospitalization and multiple sedations. Following walks and runs, you can check over your pet to ensure no bristles are stuck to their fur or within their mouths and remove them before they have a chance to embed themselves within the skin. Regular grooming can help make spotting the foxtails easier. Stewart explained that the majority of incidents involving pets and foxtails occurs in July and August with a few cases in September and October.